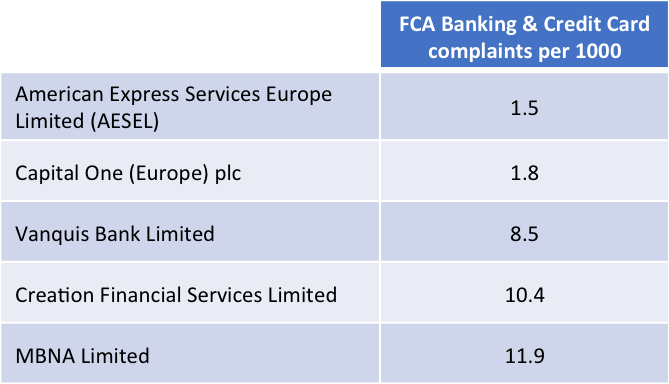 The FCA’s biannual complaints publication has changed. And today, the fruits of PS15/19 are on display for the first time. The publication of this information will provide a new, fuller data set. Although it won't be comparable to historic data, the new data set is meant to be more informative for consumers and industry (e.g. it will include figures putting the number of complaints into context in relation to the size of each business), and give the regulator better intelligence. < 30th June 2016: Complaints not handled to the complainant’s satisfaction by the close of the next working day were reportable to the FCA. Some 60% to 80% of all complaints were estimated to be resolved within this timetable. > 30th June 2016: All complaints handed are reportable. And to enable fairer comparison between businesses, complaints volume will be set in the context of the size of the business. 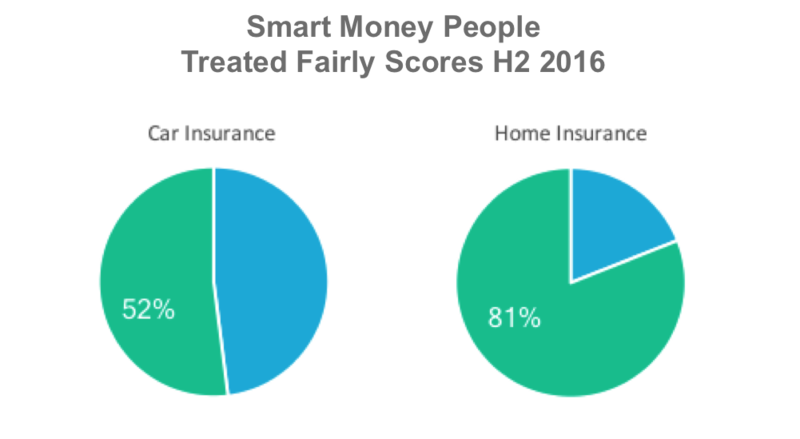 We’ll be sharing some of our H2 2016 complaints analysis below, and adding some of the insight gained from the feedback consumers have shared via Smart Money People in H2 2016. As part of leaving a review on Smart Money People, 18 structured and unstructured data points are captured. This ranges from the type of product, an overall rating, some free text that explains the rating given (typically 47 words) and some demographic details such as age and gender. "Some customer advisors can't be bothered to do their job properly"
"I was not treated fairly as they gave me no fair choice about changing my policy. They didn't try and get me a good quote and had doubled my quote and couldn't not give me a good reason to it"
"Not empathetic to hard times"
"Very poor customer service, long waits, etc"
We collected 6,721 individual pieces of freely volunteered feedback about financial services firms during H2 2016. According to the Financial Ombudsman Service (FOS) annual review 2015/2016, women are less likely than men to say they’d had a problem with a financial product or service and are also less likely to make a formal complaint. 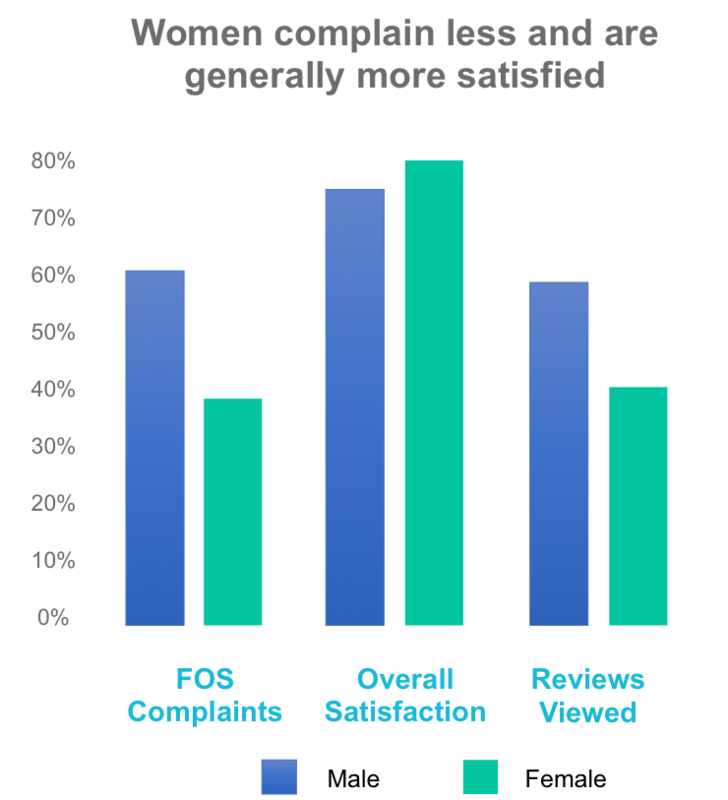 39% of total reported complaints reported to FOS were from women. On Smart Money People, women are more likely than men to write an online review, and in H2 2016, the overall customer satisfaction rating for reviews written by women was 80.1%. For men, this figure was 75.2%. But although women are more likely to write reviews, men are more likely to read reviews, as 59% of visitors to the Smart Money People website in H2 2016 were men. Irrespective of total policy volume, our data shows that we have a car insurance problem. Just 52% of our car insurance reviewers feel that they are fairly treated by their insurers, with 81% for home insurance showing a sharp contrast. This may make consumers keener to adopt new players and InsurTech, or contribute to poorer engagement with the Insurance industry as a whole. 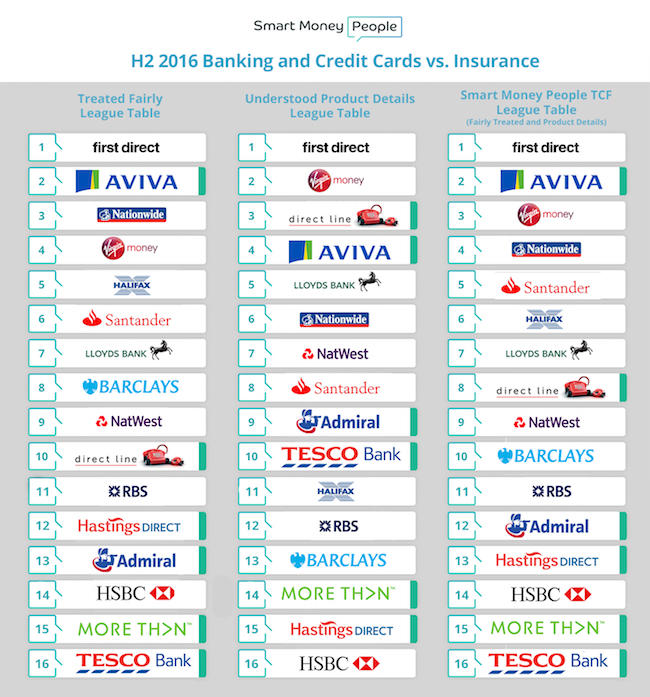 Using some of our data, we’ve created a view of how leading banking and insurance firms are performing on our site. With the very notable exception of Aviva, insurers tend to find themselves at the foot of our tables. Notes: Not all firms have received a complaint per 1000 rate at a brand level. The number of credit card complaints in H2 2016 was 313k. As a proportion of total complaints, credit cards accounted for 10% of all complaints (up from 6% in H1 2016). Note, we've selected a range of credit card focused firms, and while Creation Financial Services Limited are best known as a credit card provider, they also provide other consumer credit products like personal loans. The publication of H2 2016 complaints data in line with PS15/19 requirements was intended to make it easier for firms and consumers to better understand which firms are leading the field, and which have a long way to go when it comes to delivering good customer outcomes. 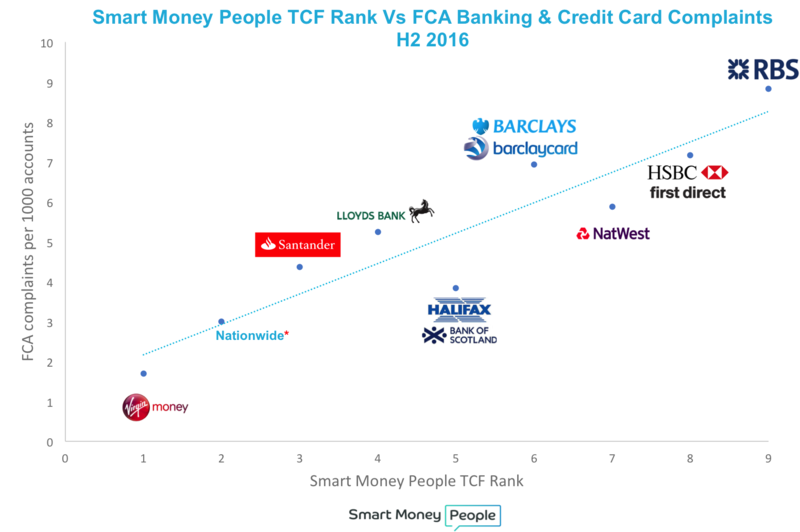 While the data released today is a step in the right direction, and it's encouraging to see positive correlation between Smart Money People data and the data gathered by the regulator, there's more that could be done to ensure fairer comparison. It's our view that for a truly fairer comparison between firms to be enabled, the regulator should go a step further, and publish product-level metrics. Given some of the significant variances we see (e.g. between home and car insurance), this would be the only way a truly fair comparison could will be achieved. We recently announced our Complaints Summit. This event will be held in London on 19th September, and is a must attend event for anyone engaged in managing and better understanding complaints in financial services. Find out more by visiting the Complaints Summit website today.